A favorite of cooks all over the world, the classic Spanish paella is a delicious as it is beautiful. Traditional design with flared sides and dimpled interior for ideal caramelized paella crust. Convenient non-stick interior and cover help to perfect any recipe!. Features: Steel construction provides quick and even heating.|Highly durable nonstick cooking surface for lasting food release and easy cleaning. 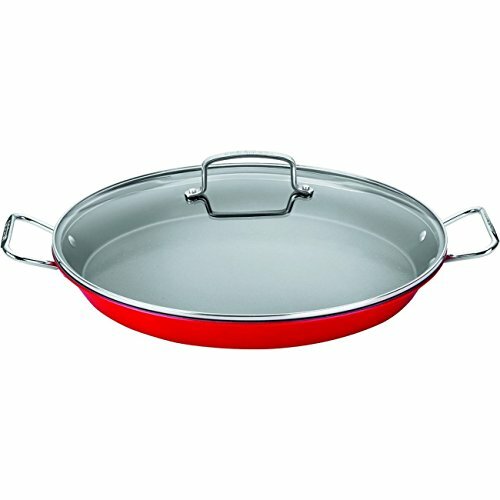 Pan interior is designed with dimples to promote uniform heating and moisture retention.|Oven safe to 400 F. Glass lid is oven safe to 350 F. Cook on stovetop or in oven.|Ergonomically designed stainless steel handles are contoured for a secure grip and riveted for strength and durability.